Black Raspberries have many uses; they have been used to make wine, jams, jellies, pies and even black raspberry topping sauce. Available all year long. Pour the melted butter into the bottom of a 7"x11" baking dish. Mix together the milk, 1 cup sugar, flour and baking powder. Pour this mixture over the butter. DO NOT STIR. Pour the berries over the batter and butter. DO NOT STIR. Pour the remaining sugar over the berries. DO NOT STIR. Bake the cobbler at 350°F for 30 to 45 minutes, or until the crust is browned and set. In addition to the phenomenal taste and color of the Black Raspberries they also have a lot of nutritional value. This berry is shown to have one of the highest amounts of antioxidants of both fruits and vegetables. Black Raspberries have a very high content of anthocyanins, which attributes to the characteristics of antioxidants in the Black Raspberries. Researchers are currently linking anthocyanin activity to improving vision, controlling diabetes, improving circulation, preventing cancer, and retarding the effects of aging, particularly loss of memory and motor skills. New research strongly suggests that a mix of preventative agents, such as those found in black raspberries, may more effectively inhibit cancer development than single agents aimed at shutting down a particular gene. Each 5 Lbs. of Raspberries is shipped as two 2 1/2lb. bags packed in a styrofoam cooler with a large gel ice pack and then placed into a cardboard box for shipping. 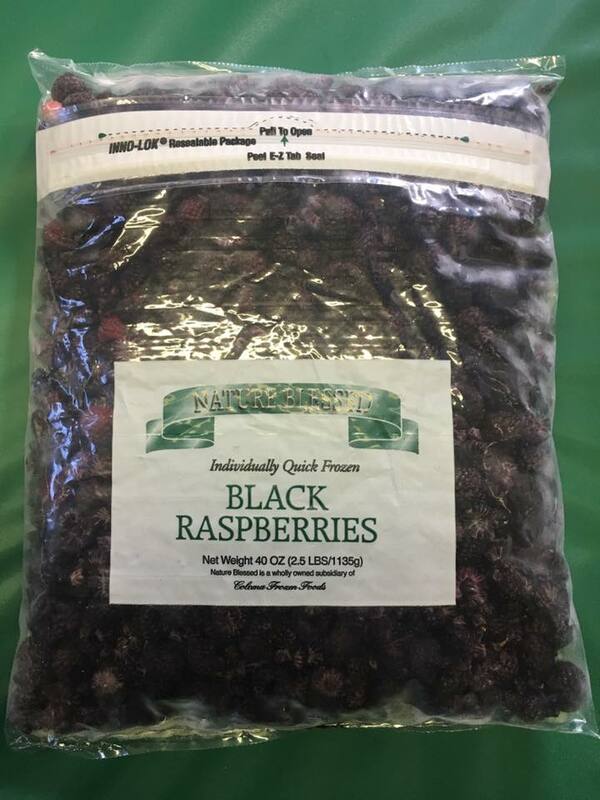 When ordering keep in mind that if you want the black raspberries to arrive frozen you need to choose an overnight or 1 day shipping option. If you choose another shipping option the black raspberries will thaw some, but can be re-froze when you receive them. We ship Monday and Wednesday of every week all year long excluding holidays. Keep in mind when ordering that there is always less thawing in the fall & winter months than in the summer months.